Best-selling Scottish crime writer Stuart MacBride, whose DI Logan McRae tales expertly blend humour and horror, returns to New Zealand next week for a couple of library events. I'm gutted that I'm overseas and will miss this - I've met MacBride a couple of times (in New Zealand, and at Harrogate), and he's a really funny and interesting guy to chat to. I'd highly advise any crime fiction fans in Auckland and Wellington to get themselves to these events next week - I'm sure you'll have a blast. Detective Inspector Logan McRae is finally getting back on his feet after the events of the past few years. Putting things behind him. Getting better... But it was never going to last. The first body is chained to a stake: strangled and stabbed, with a burning tyre around its neck. But is this a gangland execution or something much darker? I wrote a feature article on MacBride for Good Reading magazine a few years ago (see image above) - unfortunately this isn't available to read online. 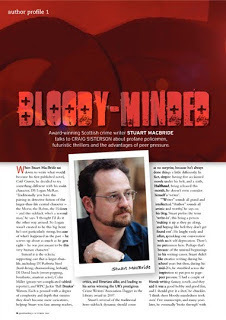 However, you can read some more about my interview with MacBride, including some interesting Q&A snippets about switching from futuristic thrillers to crime novels to get his break, his crime writing influences, and his cat Grendel that didn't make it into the final article, here.